Pompon tree, Pincushion tree, Kannabast. 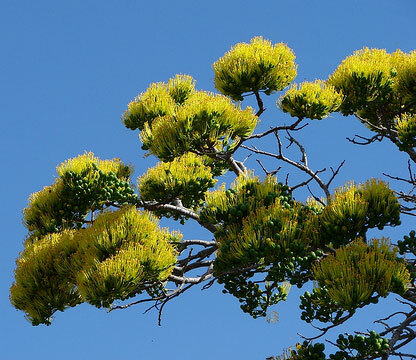 The pompon tree is one of the best known and well-loved African trees, tough enough to be used as a street tree and small enough to fit into most gardens. When in flower it looks like a giant candy floss, as the tree transforms into a cloud of soft pink balls. Desert Spoon. Curious plant: mounding grass-like succulent clump of silver-green points. 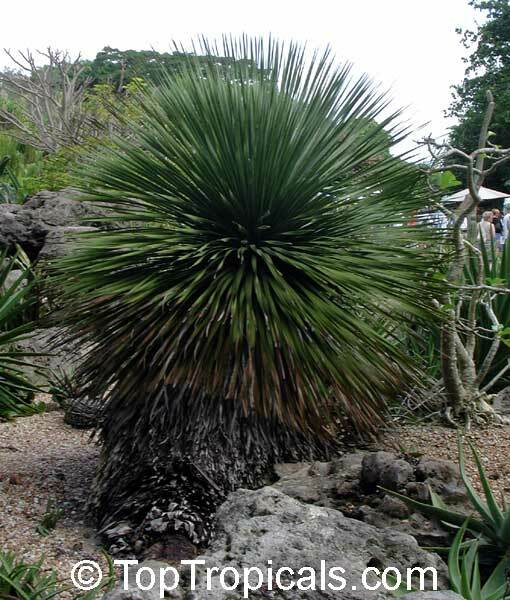 Needs good drainage, found naturally on rocky slopes. Barely cover with sandy mix. Moisten when nearly dry. Bright light. Do not keep wet. 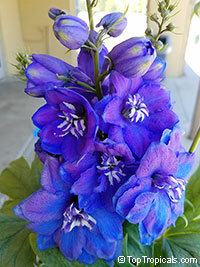 New cultivar with light-lavender, almost blue flowers. Very easy to germinate, fast growing. Nice compact plant with fragrant flowers, can be grown indoors. Cover with 3/8" soil. Keep warm, damp and in bright light. 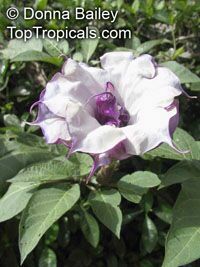 Pleasantly fragrant, six inch white flowers flushed purple or indigo in the throat. Good for containers. 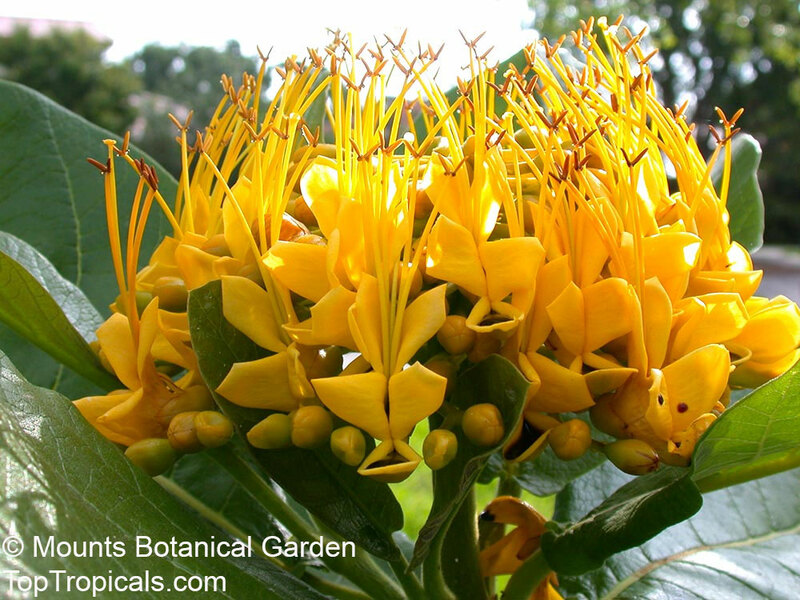 A dynamic border and container plant with large, beautifully double, frilled flowers of canary yellow. 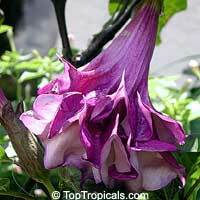 The many flowers are earlier than most varieties and will continue through to frosts. 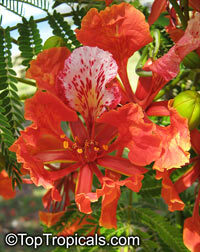 Makes a stunning conservatory plant too. Flowers mid to late summer. Height 140cm (5 feet). Sow February to March. Soak seed in warm water for 24 hours before sowing. Place seed on the surface of lightly firmed, moist seed compost in pots or trays and cover with a fine sprinkling of compost or vermiculite. Seal container inside a polythene bag and keep at a temperature of between 15-20C (59-68F). After sowing, do not exclude light as this helps germination. Keep the surface of the compost moist but not waterlogged; germination usually takes 21-60 days. 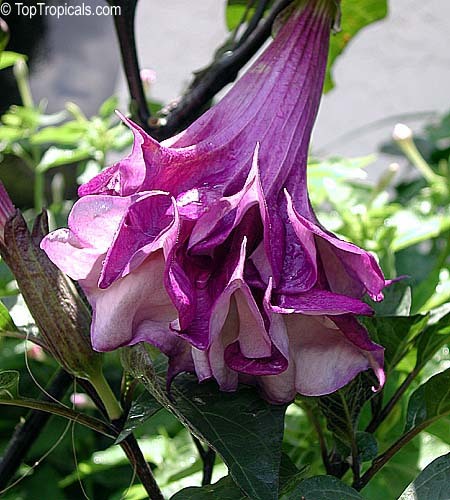 Purple Horn-of-Plenty. 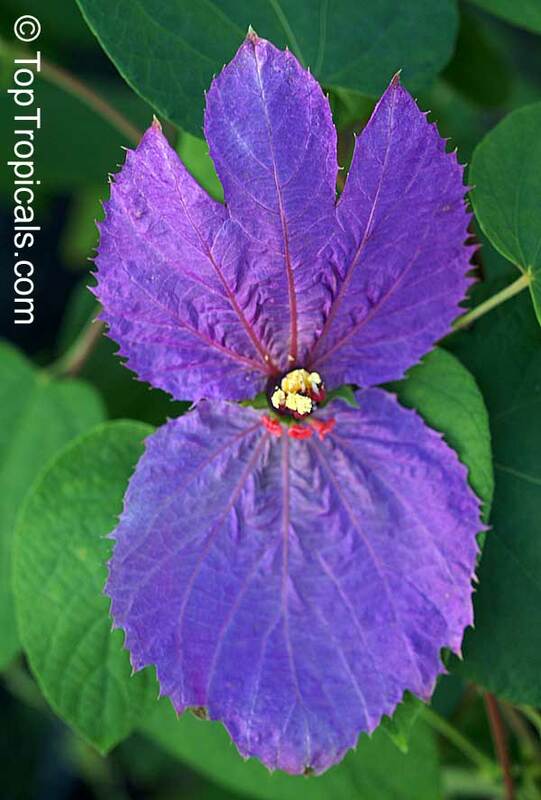 Very easy to germinate, fast growing. Nice compact plant with fragrant flowers, can be grown indoors. Variety with purple flowers releasing a wonderful fragrance. Good for containers. Start plants early. 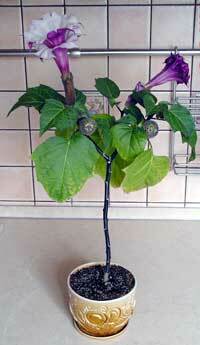 Germination: 2 to 4 weeks (steep in water then sow and keep warm.). Very easy to germinate, fast growing. Nice compact plant with fragrant lowers, can be grown indoors. Low growing shrub, takes 5-6 months from seed to bloom. 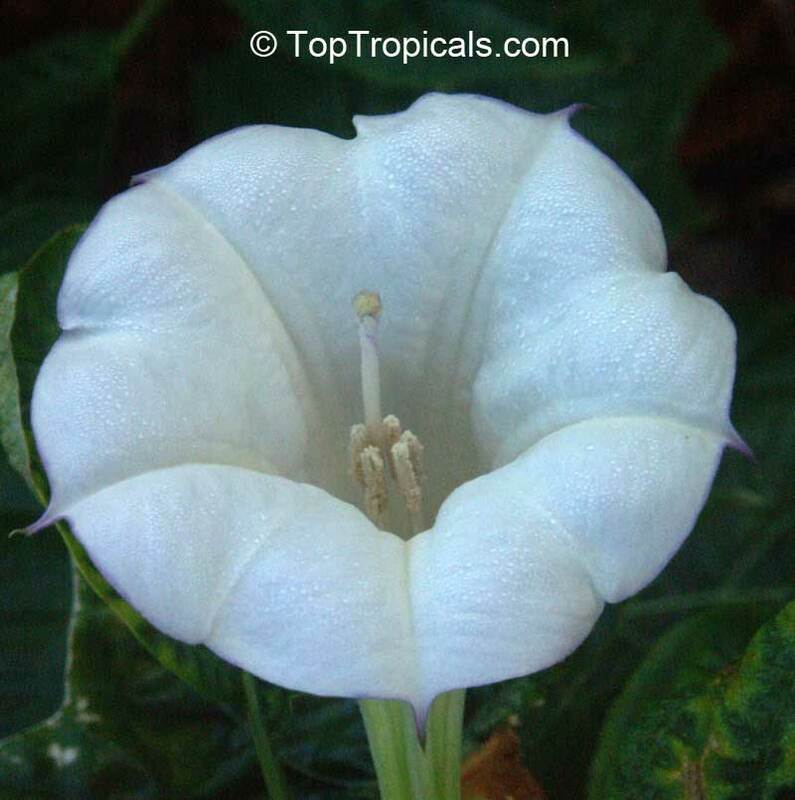 The flowers of this species are white with hues of blue / purple and very aromatic. Tolerates some frost. 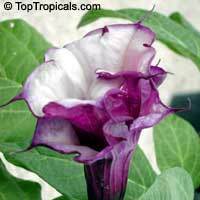 Plant seeds at a depth of 3/8" using well draining soil mix. Keep warm, damp and in bright light. 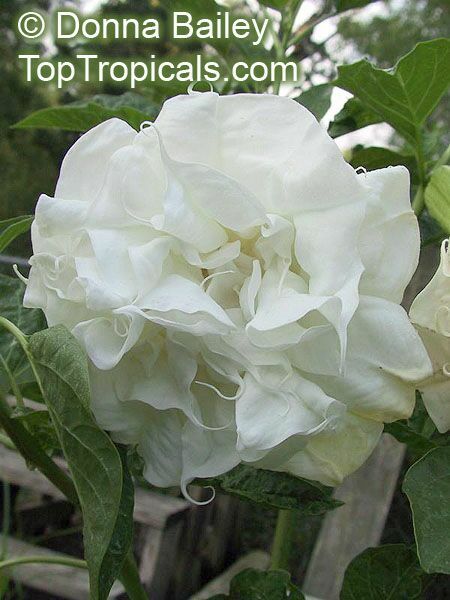 Variety with big double blooms releasing a wonderful fragrance. Good for containers. 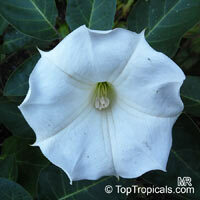 Cover with 3/8" soil, keep warm, damp and in bright light. Germination: 2 to 4 weeks. 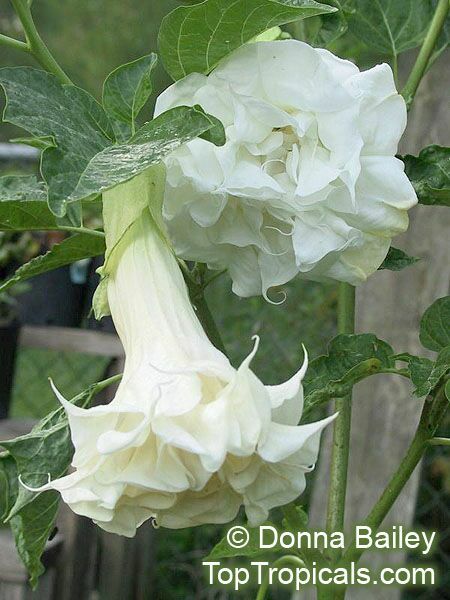 The plant produces trumpet-shaped single pure white flowers with lilac center. 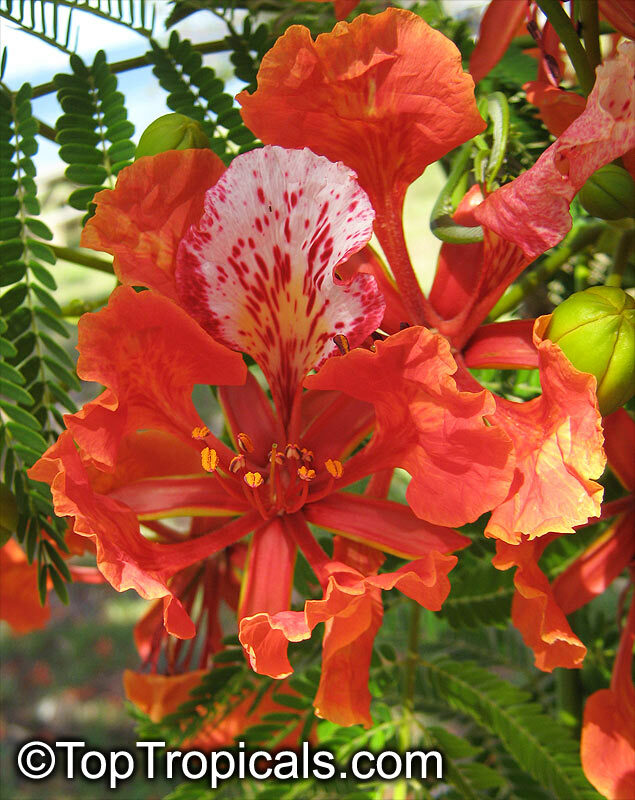 They attract bees, butterflies and moths. 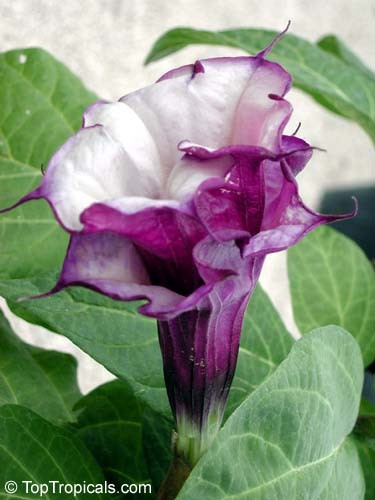 Cover seeds with 3/8" well-drained soil mix, keep warm, damp and in bright light. 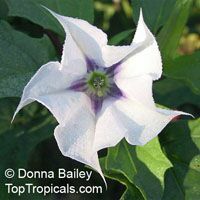 Datura with white fragrant flowers. 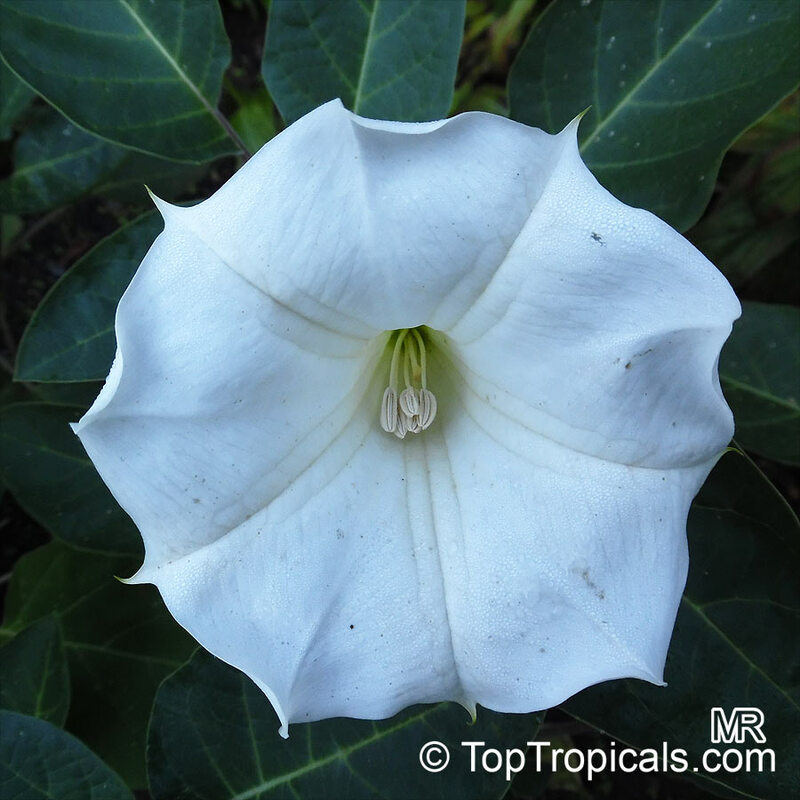 Large single white flower, dwarf plant. The plant produces trumpet-shaped double pure white flowers. 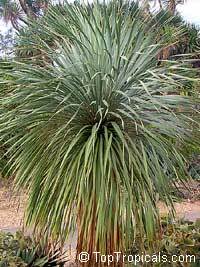 Grows best as a container plant and likes full sun to partial shade. 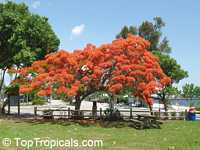 It will will grow up to 5 feet tall producing a large number of blooms. A rare African fruit tree, small to medium size. 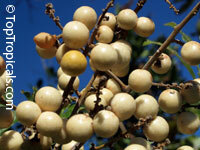 It is related to Litchi, Longan, and Rambutan. 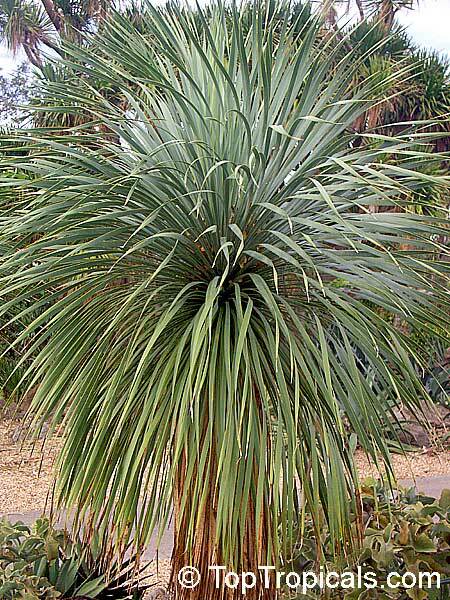 It is much hardier though, tolerates poor soils and is relatively drought tolerant when established.Fruit are not as juicy as Litchi or Longan as they have less pulp and large seed, however they have very pleasant, aromatic sweet flavor resembling pineapple. Seedlings start fruiting within 3 years from seed. Delphinium has stunning bright blue flowers and is native to high mountains of tropical Africa. 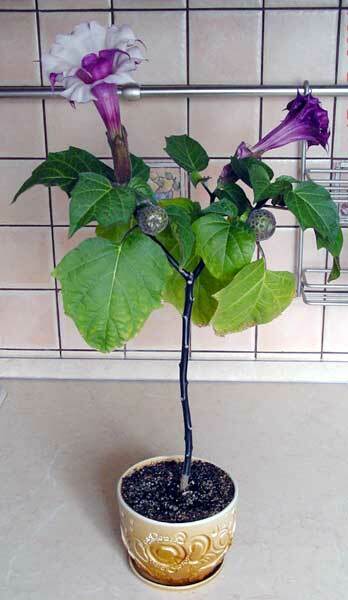 The main flowering stem is erect and is topped by many flowers. 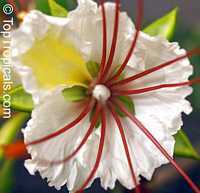 The flower has five petals which grow together together to form a hollow flower with a spur at the end, which gives the plant its name. 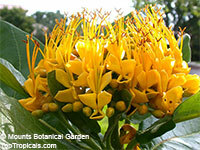 The plants flower from late spring to late summer, and are pollinated by butterflies and bumble bees. The scientific name describes the shape of the bud, which is thought to look like a (rather fat) dolphin. 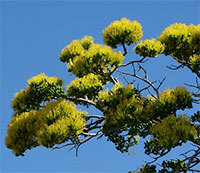 A spectacular rare tree with huge bunches of bright, yellow, bird attracting flowers during winter and spring. Leaves are huge - 1-2 ft long, velvet and tropical looking. 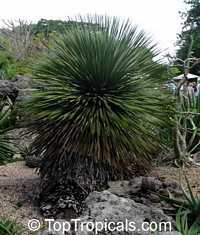 Can be grown in a pot as a rare specimen in a greenhouse. 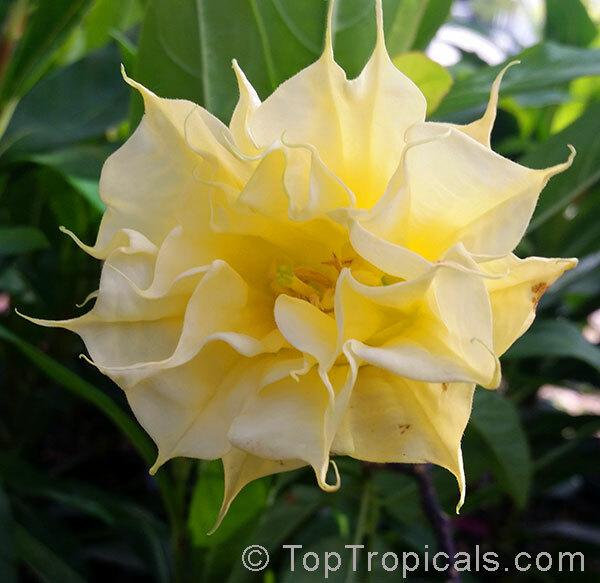 A must for a rare plant collector! 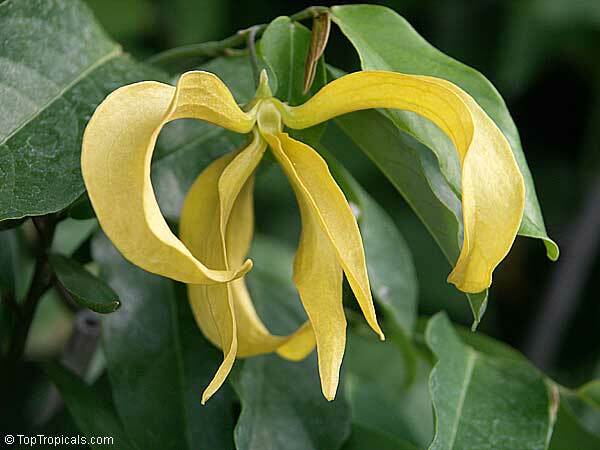 Ylang Ylang shrub. 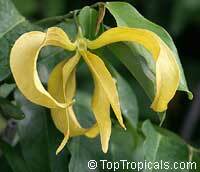 Not everybody can grow Cananga odorata, Ylang-Ylang Tree - fast growing and pretty big. 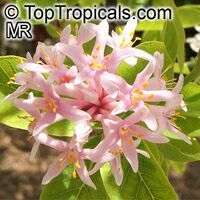 With the Desmos chinensis, a small relative you get that intense fragrance but in a plant that can be kept around 3 to 4 feet. It is a better choice for those with limited space.